With its 62 000m², the Place Bellecour is the biggest square of Lyon and the biggest pedestrian square in Europe. In the middle, we can find statues of Louis XIV, of the Petit Prince and Antoine de Saint Exupéry. 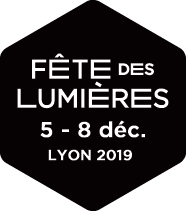 They are often a « source d’inspiration » for the artists of the Fête des Lumières. The Anooki have taken on an extra dimension. Place Bellecour is the new playground for these huge characters as this monumental installation turns the venue into a child's bedroom. The statue of Louis XIV is nothing more than a tiny lead soldier on the Anooki-scale, just like the genuine fire engine that seems to be the size of a toy. Marbles are scattered across the square, illuminated by the rotating Ferris wheel – a Ferris wheel that has been transformed into a nightlight onto which the Inuit dreams are projected every 15 minutes.